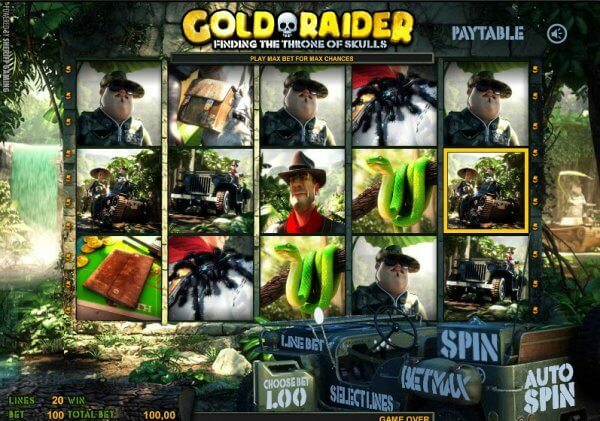 The main character in Gold Raider slot is an adventurer who is hunting for treasure in a jungle, in the hope of finding it before criminals do. The game is an online slot, and it has five reels and 20 adjustable paylines. A range of bets can be placed on its reels, and optional features such as Auto Spin can be brought into play. It’s a 3D video slot, which means it has a number of bonus features as well as clear, detailed graphics and animated clips from Aristocrat pokies. The graphics-rich symbols on the reels of Gold Raider slot form combinations that either award coin payouts or activate the game’s bonus features. The general rule for paying combinations is that they are formed by symbols landing on the reels from left to right on active paylines. Symbols featured in the base game include the main character, two villains, a truck, a tarantula, a snake on a branch, a pistol, a watchtower, a journal, a satchel, and a Skill symbol. The snake is the highest paying of the regular symbols. The free spins round has its own set of symbols, with a golden monkey statue, a temple, and an orb. Gold Raider slot launches with an opening clip that introduces the characters and storyline. When the main screen with the reels opens, the bet can be set using various buttons on the interface. Between one and 20 paylines can be chosen, and coins can be valued at between 0.01 and 1.00. Between one and five coins can be bet on each of the selected paylines. One of the Gold Raider slot bonus games features a Wheel of Fortune. The game is accessed when a pistol symbol lands in the middle of the fifth reel. The Wheel of Fortune is on a second screen. The wheel is spun only once to win a prize, each time the game is accessed. Gold Raider slot’s Wild symbol is the watch tower, which appears only on the third reel. The Wild can fill in for other symbols, and help them form successful combinations on the reels. The symbol can also expand from its position on the reel to fill other positions on the same reel. In that way, one Wild can be part of a few winning combinations. The Skill symbol on the Gold Raider slot reels is the key to the free spins round. Three or more of the symbols must land in any position on the reels to trigger the round. Eight, 15, or 25 free spins will be awarded in each round; the number dependent on how many Skill symbols triggered it. The main character appears among the set of symbols featured in the free spins round, and if three or more of him land on the reels, more free spins will be awarded. The two other bonus features in Gold Rush slot are the Extra Cash bonus and the Click Me bonus. The first is triggered by the satchel, and the second by the journal. The satchel appears on the second, third, and fourth reels only. When a satchel lands on each of those reels, an additional payout is awarded. The Click Me bonus game is triggered whenever three or more journals appear on the first third, and fifth reels. Played on a second screen, various symbols must be selected to win prizes.